...And with this the eternal world rises more brightly before me and the basic law of its order stands clearly before my mind's eye. In it the will, as it lies hidden from all mortal eyes in the secret darkness of my heart, is the pure and sole first link in a chain of consequences which runs through the entire invisible realm of spirits, just as in the earthly world the act, a certain movement of matter, becomes the first link in a material chain which flows through the whole system of matter. The will is what is effective and alive in the world of reason, just as motion is what is effective and alive in the world of sense. I stand at the midpoint between two directly opposed worlds: a visible world in which the act is decisive, and an invisible, incomprehensible world in which the will is decisive. I am one of the original powers for both worlds. It is my will that embraces both. This will is already in and for itself a component of the supersensible world. As I move it through some decision I move and change something in that world and my efficacy flows out over the whole and brings forth something new and everlasting which then exists and does not need to be made again. This will break out in a material act and this act belongs to the world of sense and does there that which it can do. We will take leave now of Kant's careful methodologies and plunge into the Black Forest of German Idealism, what Rüdiger Safranski calls "the wild years of philosophy." The founder of this movement was Johann Gottlieb Fichte (1762-1814). He was a prolific writer; his Gesamtansgabe or collected works runs to 35 thick hardcover volumes, each about 500 pages, in the German edition. He wrote extensively on politics, positing a theory of natural rights and their relationship to the state that was highly influential on Hegel, and through Hegel Marx, although Marx negates his received tradition and "turns it on its head" to posit Historical materialism. Fichte wrote on theology. Attempt at a Critique of All Revelation (1792) is an example from this genre. Most centrally, Fichte wrote on philosophy, and his major philosophical work he called the Wissenschaftslehre , or Theory of Science. From his exposure to the Critical Philosophy of Immanuel Kant, Fichte had been seized by what he felt to be the central insight of Kant -- that of the transcendental subject. An understanding arose in him that he later characterized as being struck by a thunderbolt. He would exhort his audiences, for he was a famous lecturer at the Universities of Jena and Berlin, to repeat in themselves this philosophical insight -- to discover themselves to be the transcendental thing-in-itself, the noumenal reality outside of time and space, and therefore causally groundless, without necessary determination, free. His argument to demonstrate this position he called the Wissenschaftslehre , and so this is not meant to be the title of a particular work, but rather a designation for the philosophical position itself. This formed the foundation for his whole mature philosophical output, and he was continually reformulating and redrafting it. There were no less than 16 versions of the Wissenschaftslehre he worked on. The process was complicated by his belief that oral engagement with an audience was most efficacious in imparting an understanding of his import. In this way, as in others we will encounter, Fichte is very much like an Indian Philosophical pandit, or even guru. The personal satsang, or dialog with the sages, is believed to be efficacious in obtaining knowledge of the Atman. We will compare and contrast the philosophy or darshan of Advaita Vedanta with that of the Wissenschaftslehre . But first, let us closely examine Fichte's position. We will be using the earliest, most influential full presentation of the Wissenschaftslehre from 1794. This was given as a lecture series at the University of Jena and then typeset and printed from Fichte's relatively unrevised lecture notes. It has three parts and we will be focusing on the first part, which is his argument for the I as absolute reality. Fichte begins by stating that it is his task to discover (anbyersuchen) "primordial, absolutely unconditional first principle of all human knowledge," which is the conscious self or "I" (ich). The first principle or foundational principle of epistemology cannot be proved (beweisen) or defined (bestimmen), but only discovered (aufgesuchen) because it cannot be demonstrated in terms of something else, being the first principle. Rather, all principles of human knowledge are derived from it. Fichte now argues that "every logical proposition and logic in its entirety must be deduced from the Wissenschaftslehre ." (EPW pg 123) In other words, logic has its foundations and ground in the "I". It is the "I" that posits the form of logic. The fundamental axiom of logic, from which all other axioms are derived (in the form of logic as understood by Fichte) is the principle of identity, A = A. Fichte writes, "A = A is undoubtedly a logically correct proposition, and insofar as it is, it means 'if A is posited, then A is posited.' This raises two questions: Is A posited? And, why and to what extent is A posited, if it is posited? Or, in other words, what in fact is the connection between this if and this then?" (EPW pg 124) So, under Fichte's analysis, A = A is revealed to contain an assumed structure that has not yet itself been determined. The principle of identity is now derived from the "I". This style of argument is typical of German Idealism. It is flashy, rhetorical, asserting vast metaphysical implications, and perhaps riding a little too rough-shod over possible alternative arguments. The analytical tradition has tended to eschew this type of philosophy. Indeed, Russel and Moore first founded it based upon a rejection of the British adoption of Hegelianism they had been exposed to as students. Yet we should not be too quick to reject the philosophical rhetoric of German Idealism, even if we do not accept that its grand systems succeed. In particular, the passage quoted above includes what may be an important philosophical concept concerning consciousness: that consciousness is always identical to itself. It has no distance from itself to cross to have itself as its object. It is its object. Therefore, subject and predicate, subject and object collapse in this identity. This is a feature unique to consciousness, and it may have important ontological implications regarding the nature of consciousness. But does this feature at all necessarily imply that idealism, as opposed to realism, is the absolute metaphysical state of affairs? We will return to this question, but first let us pick up where we left off with Fichte's argument in our text of the Wissenschaftslehre . We will see, when we come to Sartre, just how similar this position of the Wissenschaftslehre is to his concept of consciousness as a Being-for-itself, as opposed to the Being-in-itself of phenomenal objects, and how this is a Nothingness that is free. The historical inheritance of ideas will also become clear when we see how much Being and Nothingness follows the structure of Hegel's Phenomenology of Spirit . Fichte now addresses himself to the question, "What was I, then, before I came to self-consciousness?" This question implies an objection to the Wissenschaftslehre , which is to assert that my I did not exist before my birth, and is therefore posited not by itself but by a (potentially essentially non-conscious) world that ontologically presupposes the self. The body in its world, it seems, is a presentation of the self to itself (a prefiguration of Hegel), and as with the rest of the world a mere appearance or representation. But how is the body mine, as opposed to all the other objects as appearances to the I? How is it a "self as object" as Fichte calls it? Fichte does not adequately recognize or address this relationship between consciousness and body. Instead he refers, in perfectly Cartesian form, to a "Substrate" that consciousness somehow acquires through a positing of itself, "which exists, even though without real consciousness, and though of, moreover, in bodily form." What is this talk of an existing non-conscious substrate? Is Fichte contradicting himself? If the existence of things-in-themselves is denied, and objects reduced to mere appearances posited by the absoute I, then Fichte's idealism should not be able to posit an existing non-conscious substrate. Or can he? By calling it the self as object, Fichte implies that the I is somehow outside of itself as the world,and not merely the position of appearances to itself, like a kind of slide show. Therefore, Fichte's idealism cannot be like Berkeley's, where objects are reduced to appearance and nothing more. However, Fichte's system only partially explores the terrain of this new understanding of world as subject opening up. It seems that there is almost a need, a will, built into the very grammar of Fichte's thinking for the I to erupt out of itself into and as history. Here is the seed of the dialectic, which shall reach its apotheosis in Hegel. Here consciousness, the I, is understood as being prior to thinking, to cognition. Can we still say that the I is consciousness for Fichte, if the I is a self-positing existence ontologically prior to thought? I think yes, that for Fichte the I is consciousness, through and through, because it can only be identified to itself on the basis of being consciousness -- and it is primally and fundamentally the I in virtue of this self-identity, as already discovered by the Wissenschaftslehre . So, according to Fichte's system, the absolute I prior to appearances posits out of itself the empirical I of thought, our mental stream of representaitons, as well as the world which that mind cognizes through representation. Again, here is one of the basic concepts of German Idealism: the absolute consciousness or spirit (the German word Geist, used by Hegel, means both mind and spirit) that emanates the world out of itself. In the next section of the Wissenschaftslehre , Fichte presents an argument regarding the relationship of what he calls the principle of opposition (A ≠ -A) to the principle of identity (A = A) and how this in turn relates to the nature of the I. From this, a new concept is derived, that of the "not-I". Fichte writes, "If any -A is to be posited, an A must be posited." (EPW pg 49) Therefore, the principle of identity presupposes the principle of opposition. Although he does not explicitly state it in such terms, Fichte's thinking at this point is in accord with the form of the Transcendental Deduction -- therefore, the I that is the foundation of the principle of identity, that is the A that is posited, in the case of the I by itself, so as to be itself -- also posits the -A, or in this case the not-I. We can see here that the Wissenschaftslehre proceeds through a certain logic that it develops as it goes, deriving itself from its first or foundational principle, in this case the I. In this, the Wissenschaftslehre is an axiomatic system, or at least Fichte is struggling in his many drafts to make it such. Euclid's Elements stands as the great classical exemplar of this in the Western tradition, although Fichte's immediate model is Spinoza's Ethics . "As surely as the absolute certainty of the proposition '-A is not equal to A' is unconditionally admitted among the facts of empirical consciousness, so surely is a not-self opposed absolutely to the self ... and with this we have also discovered the second basic principle of all human knowledge." (EPW pg 50) The first principle being the absolute self-positing of the subject. The third basic principle of all human knowledge, according to the 1794 Wissenschaftslehre , is formulated as follows: "Insofar as the not-self is posited, the self is not posited; for the not-self completely nullifies the self." (pg 55) The word translated "nullify" here is a form of the verb aufhaben -- a key term in Hegel's dialectic. However, Fichte's use here predates Hegel's technical elaboration of the word, and has a general meaning to negate or nullify. What I think Fichte is trying to do with the third principle is to identify and address a core tension within his philosophical conception. We could phrase the tension as follows: that subject and object have an innate ontological opposition to each other when conceptualized within Fichte's idealism. If consciousness posits itself, then what is this world that is an appearance to it? This world threatens consciousness with materialism -- with the metaphysical option that subjectless matter posits consciousness -- that it metaphysically underlies it and thereby undermines and negates the meaningfulness of life felt by the subject, it becomes a mere determination of a causally necessary chain of events -- it loses its freedom. This anxiety, as real or unreal as it may in fact be, is the crisis of modern philosophy, and felt nowhere as acutely as in Fichte's moment. The anxiety is ontologized in the system of the Wissenschaftslehre , which asserts the positing of the not-I by an absolute subject; but what is this not-I that is not the self? Howe are the I and the not-I to be unified, yet remain simultaneously preserved in their opposition? As Fichte sums up the metaphysical conclusion to the third basic principle of the Wissenschaftslehre , "In the self I oppose a divisible not-self to the divisible self." By divisible, Fichte means to make a technical point -- that the finite-I and the not-I possess "the capacity for quantity in general, not any determinate quantity." (pg 61) -- Quantity being one of the Kantian categories of the understanding. 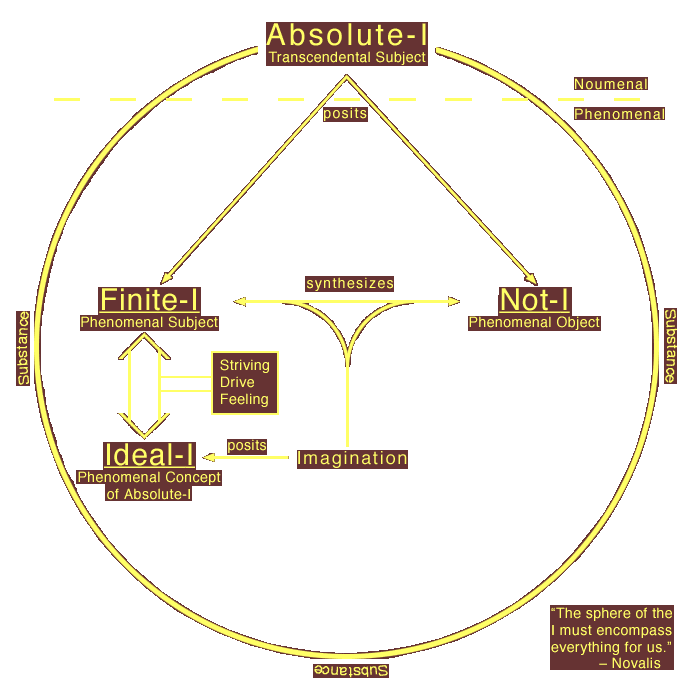 By falling under one of the categories the finite-I and the not-I are thereby phenomenal rather than noumenal according to the Kantian critical model that Fichte is working off. Therefore, I think we can confidently identify these metaphysical "regions of being" (as Sartre calls them) as the Cogito and the world of its experiences, the phenomenal subject and object. For Fichte, behind both of these as their underlying metaphysical unity is the same universal Transcendental Subject. This is the basic metaphysical model of the Wissenschaftslehre ,stated in Kantian terms. This is the basic core argument of the 1794 Wissenschaftslehre . From it, in the remainder of the text of part 1, as well as parts 2 and 3, Fichte develops a number of philosophical points. Without attempting a complete summary, we will proceed to highlight three main doctrines, those of freedom, the imagination, and the Striving, as we complete our discussion of the text with a survey of parts 2 and 3. Freedom is a core fundamental implication of the system of the Wissenschaftslehre . For Fichte, the essence of freedom is to be not the effect of some cause outside of oneself. An agent that is free is without an ontologically prior ground. It is without ground in the world, which is otherwise determined. The I is free because it is its own ground, it posits itself by its own activity. The in-itself of the causally determined world, or object, is posited by a being-for-itself, a being that is its own ground in virtue of being the self limitation of an absolute metaphysical noumenal reality. This is the subject to whom the object is a representation, a Vorstellung. Each of us here is a subject and therefore, for Fichte, essentially free simply by being so, for it is the essence of the I to be a free activity of positing. Here, we are only a step away from the philosophy of Schopenhauer. We are innately free according to the Wissenschaftslehre , but this does not mean that we always act fully in accord with our freedom. In the self-limiting of the Absolute I to posit the finite-I, the self comes into relationship with the Not-I whereby the finite-I is posited as determined by the not-I, but the not-I is also posited as determined by the finite-I. In other words, while I am affected by the world, out of my mental freedom I can affect the world by my free action in response to it. By advancing this position, Fichte situates himself as a successor to the enlightenment by having the Wissenschaftslehre provide the foundation for the theory of human essence as the rational free moral agent. Alongside freedom, another key element is played in the Wissenschaftslehre by the imagination. In Fichte, the imagination supplants the centrality of the Kantian faculty of the understanding, and replaces it as the cognitive mode whereby we encounter and process the world. The imagination is the synthesizing activity whereby I have mental representations from which arise knowledge and all my other mental activities. Therefore, the Wissenschaftslehre being a system of idealism, the imagination creates the world and is its ground. But it also creates the finite-I and its mental acts of which it is the activity of synthesis. It is therefore the meeting place for the opposites of subject and object, the location of their mediation. There is a third idea that Fichte derives from the Wissenschaftslehre , that of the Striving (Streben). Due to its self positing in a limited aspect the phenomenal finite-I is separated from the noumenal absolute I. Therefore, it posits the absolute-I to itself as an ideal. This ideal absolute-I, Fichte says, is imagined (eingebildetes) object, not the absolute-I as it is in itself, but a phenomenal projection to the finite-I within the imagination. This ideal I cannot be attained by the finite I because the finite I cannot attain to the absolute I, it can only be the absolute I in virtue of being for itself, of consciousness being identical to itself and therefore its own ontological ground. The finite-I cannot negate its phenomenality and rise above the imagination to cognize itself directly as the absolute-I noumenally. It can only understand philosophically that this metaphysics is the case, and that the free will of the I derives from its noumenality. This understanding allows the finite-I to actualize its freedom and exercise it in moral acts in accord with the basic ideals of the Kantian practical reason within the imagination. Therefore, there is an experience of separation between the finite and absolute I, despite their noumenal unity. This separation is experienced as infinite (unendlich) and it creates a striving (Streben); this striving, which Fichte also describes as a drive (Trieb), creates and grounds the emotional aspirational feeling or Gefühl. The Gefühl is a important concept within Romanticism. For example, the Christian theologian Schliermacher locates the Gefühl as the essence of religion. What are we to make of this philosophy? We might begin by contextualizing it as a historical development of the Cartesian tradition. A feature of Cartesianism is that, in its exclusive bracketing of consciousness, it creates a sense of separation between the human world, which is understood as being an interiorized conscious subject having representational thoughts, and a world of innately inert value neutral spatially extended substance. Value and meaning is ruptured from the being of the world and invested solely in the activity of the mental faculty, itself a mere function of the invisible wraith-like "spiritual" Cogito. This whispery item is threatened almost to vanish entirely -- to be replaced by existence as materialism, as mere mechanism in motion, perfectly determined, inexorable, not free, without any transcendence to ascend to. This is the almost Manichean dichotomy faced by the inheritors of the Cartesian world view. Manicheanism is not amiss as a reference here, for Cartesianism reinstates an older paradigm, inherited from the conceptual conflicts of antiquity. This leads us to ask, is this dichotomy between "spirit" and "matter", or for Descartes of soul and world, so deeply embedded in the Western psyche real? Or is it simply the playing out of a grammar of our cultural mode? But there are two different levels of human development, and, so long as everyone has not yet reached the highest level in the course of the progress of our species, there are two main sub-species of human beings. Some people — namely, those who have not yet attained a full feeling of their own freedom and absolute self-sufficiency — discover themselves only in the act of representing things. Their self-consciousness is dispersed and attached to objects and must be gleaned from the manifold of the latter. They glimpse their own image only insofar as it is reflected through things, as in a mirror. If they were to be deprived of these things, then they would lose themselves at the same time. Thus, for the sake of their own selves, they cannot renounce their belief in the self-sufficiency of things; for they themselves continue to exist only in conjunctino with those things. It is really through the external world that they have become everything they are, and a person who is in fact nothing but a product of things will never be able to view himself in any other way. He will, furthermore, be correct — so long as he speaks only of himself and of those who are like him in this respect. The dogmatist's principle is belief in things for the sake of himself. Thus he possesses only an indirect or mediated belief in his own dispersed self, which is conveyed to him only by objects. The task of the romantic idealist is to overcome the Cartesian dualism, not by deconstructing the concept of this framework, but rather by absorbing the entire universe into the infinite subject. As Novalis wrote, describing Fichte's system, "the sphere of the I must encompass everything for us." In this respect, Fichte's Wissenschaftslehre is interestingly similar to the Indian darshan , view or philosophy, of Vedanta. So far this series has been exploring Western themes of non-dualism, but it will be useful to pause to compare and contrast Fichte with an eastern philosophical tradition. We may be able to see patterns emerge and potentially deepen our understanding of these traditions. Vedanta, or to identify more properly the version of Vedanta I want to talk about, Advaita Vedanta, is an Indian philosophy of metaphysical non-dualism. The linguistic use of "non-dualism" as a philosophical concept may derive from this tradition or its immediate predecessors. the Sanskrit word Advaita means literally "not-two" and refers in this philosophy to the unity of the absolute truth or reality. The word Vedanta means "end or goal of the Vedas", the archaic hymns to the Indo-Aryan deities that accompanied the rites of the fire sacrifice. The performers of these rites were the cast of Brahmins, who developed esoteric teachings concerning the spiritual meanings of the Vedas called Upanishads, which were disseminated around the beginning of the common era. There are over 200 surviving examples of this genre, with a wide diversity of content, but eleven are considered core canon as they were the subject of commentaries by or attributed to Sankara. Sankara (788? - 822 CE) was an important leader of the revival of the Vedic religious traditions of India, which had suffered decline due to the influence of Buddhism. As with all revivals, it incorporated elements of innovation and reinterpretation as well as continuations of past traditions. Already thousands of years old in his own time, Sankara reads the Vedic tradition so as to locate its essential import as the realization of identity between the self or Atman with the supreme reality or Brahman. In a similar though not nearly so codified fashion, Fichte believed that the central insight of his system, of our identity with a free, self-posited and absolute I, was most effectively transmitted orally from himself to his audience. He would invite his audience to distinguish, in a way that the historical Vedantic tradition does not always do, between the efficacy of the oral imparting of an idea and the necessity of the same. It is certainly the case as a simple psychological phenomenon that the personal presentation of an idea face to face with its expositor carries a greater persuasive force. However, this fact becomes easily mixed with what Max Weber calls the charismatic principle, which is the tendency to exalt and focus upon specific individual leaders as the center of social movements or collectives. The cult of the Guru found within some manifestations of the Vedantic traditions, where enlightenment is understood as necessarily and solely derived from the personal relationship with the spiritual preceptor, can be read as a social expression of the charismatic principle. There has been a tendency within the historical trajectory of Vedanta to reinterpret the Vedic tradition in terms of the primacy of the guru -- often through the creation of partially or fully mythological lineages, which transmit the teachings from antiquity, or so these traditions present themselves. However, this orientation is by no means the sole and primary form of the Vedic or Indian traditions. To give one specific example, Buddhism in its older Indian form (closest to the modern Tharavadin tradition), while founded by a Guru figure, namely Shakyamuni Buddha, does not rely upon personal contact with a self-realized adept in order for the Bhikkhu, or mendicant-practitioner, to progress through the stages of enlightenment. Rather, the community or Sangha collectively serves the role of preceptor in the form of its rule or Vinaya. Sankara Vedic religion serves an essentially conservative role. Truth, having been (re)discovered through understanding of the primordial ground of Being, is to be transmitted unchanged and withut innovation. This is the pattern of a culture, not at peace and repose, but in deep anxiety over its identity under the threat of internal and external social divergence. Secondly, Vedanta and the Wissenschaftslehre : share an understanding of the self-identity of consciousness being a locating of an ontologically absolute substrate or ground of human essence. Traditional Indian philosophy defines what is real as that which is abiding and not subject to change. Physical substance is found lacking in this characteristic by Vedanta because it undergoes attenuation over time and is inseparable from causality. The Sambhya philosophy, which Vedanta adopts aspects of, postulates 24 categories of reality, called tattvas (literally "thatness"), all of which are considered modifications or evolutes of Prakriti, the absolute metaphysical object. In contrast, Purusha or Atman is seen as the absolute witness or metaphysical subject of reality. It is therefore not a tattva and lies outside of that system of causal evolution. Purusha is not subject to change or activity. Therefore, Vedanta concludes, Atman alone is real and the reality of the tattvas unreal. Vedanta further identifies Atman with consciousness itself. Each of us is Atman, or the supreme principle, in virtue of being conscious, and of being identified to our own consciousness, without separation. Since this consciousness alone is real it follows, according to Sankara's chain of argument, that everything that appears within consciousness, the world, thoughts, the sense of being a body or personal self involved with the world, have no real existence whatsoever. They are Avidya, an illusory superimposition upon consciousness. Sankara is therefore an absolute idealist in Western terminology because, for him, only consciousness exists. Fichte does not go nearly so far. Nevertheless, as in Vedanta an absolute subject grounds his ontology. However, the phenomenal realm is posited by a real activity of synthesis of the absolute-I, rather than being a pure illusion. We might specify this distinction in a different way, by seeing how Fichte's Wissenschaftslehre : and Sankara's Vedanta represent different strategies at staking out a position on non-dualism. Faced by a dichotomy between subject and object, Sankara resolves this duality to a unity by asserting that only consciousness, only subject, exists. Fichte's approach is different. His position is that subject and object, finite-I and not-I, are posited by an absolute-I that is the metaphysical, noumenal unity underlying phenomenon. 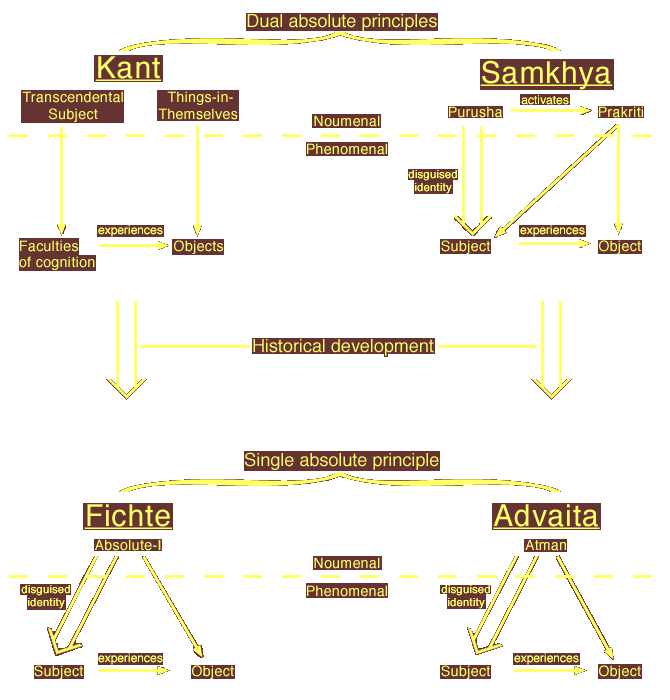 In the case of both Samkhya and Kant's Critical philosophy there are two distinct noumenal metaphysical elements. These are the Transcendental Subject and Things-in-Themselves for Kant and Purusha, and Prakriti for Samkhya. In contrast, Fichte and Sankara postulate a single noumenal reality from which phenomena derive their appearance, namely the Absolute-I and the Atman. To what extent is this need to unify conceptual dichotomies into a unity built into the grammar of our language itself? That is to say, to what extent is "non-dualism" a conceptual strategy of our language use, rather than or in addition to its actual truth value? Do these metaphysical concepts (i.e. Absolute-I, Atman, things-in-themselves) fail of reference? In other words, do concepts correspond to actual noumenal realities, or are they merely conceptual? And how would we know?